Features an efficient 16-watt built-in pump capable of pumping water as high as 16,4 feet vertically. This allows for continuous upward drainage to drain moisture out of a basement window or into a sink. At just 45 pounds, our compact unit fits in most spaces. Removes 70 pints of moisture a day in areas up to 4,500 sq/ft. 6-foot power cord makes extension cords unnecessary. See operating settings at a glance and get important filter and reservoir alerts with the simple LCD interface. The LCD accurately displays the current humidity level in the room, enabling you to set your ideal levels for automatic moisture control. Program the 24-hour timer to suit your lifestyle and save energy costs. Removable 2.25-gallon tank features transparent level indicator and comfortable handles with cover for convenient removal and carrying when full. Water level sensor triggers automatic shutoff when reservoir fills to capacity. 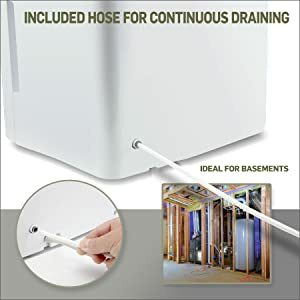 Optional hose connection allows continuous draining in damp rooms. Divert water to basement drain or slop sink. Eco-efficient auto-defrost prevents wasted energy and protects evaporator coils. Multiple green features earn our model official Energy Star certification. At just 48 pounds, it fits discreetly in most spaces. 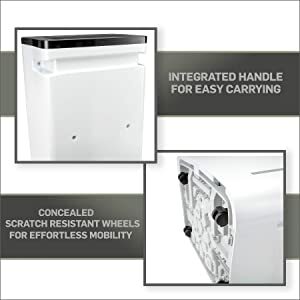 Durable smooth-rolling caster wheels ensure portable ease, and you can customize air regulation with two fan settings, for effective moisture removal in areas up to 4500 square feet. 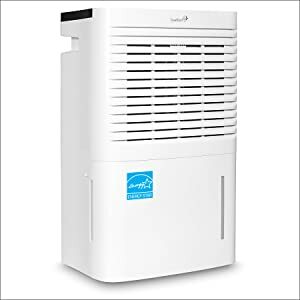 Our innovative filtration and evaporation system ensures a safe and pleasant atmosphere by preventing mold, mildew and structural cracking, and safeguarding your family against allergens, mites and asthma triggers. 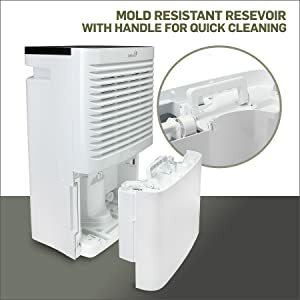 Remove up to 70 pints of moisture a day for relief during humid months. 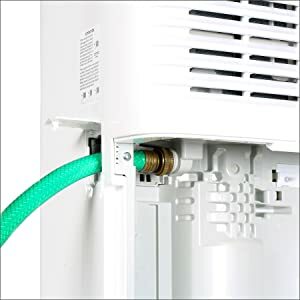 Simply empty the high-capacity 1.6-gal reservoir upon auto-shutoff, check the level indicator, or hook up the optional hose for continuous draining.